Since the original formation of the Business Association in 2012, Mt. Airy CDC has been able to extend its business development and marketing activities throughout the neighborhood. The Go Mt. Airy Business Association (GMABA) focuses equally on sustaining local businesses and inviting new businesses to the area. Our vision with the Association is to help promote, educate, and sustain local businesses. We do that through a number of channels, including networking events, workshops designed specifically for small businesses, promotion through our popular Go Mt. Airy social media channels, and more. Mt. Airy CDC has also created festivals and events like Supper Sessions on the Avenue, Moonlight Movies, Autumn on the Avenue, and previously Street Fare and Final-ly Friday, all of which provide key marketing opportunities for businesses while shining a spotlight on the neighborhood. 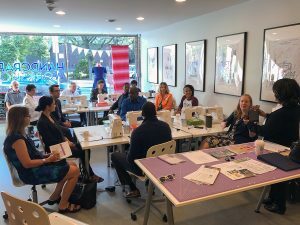 A networking event at Handcraft Workshop in fall 2017. SIGN UP AT THE DEVELOP LEVEL HERE. 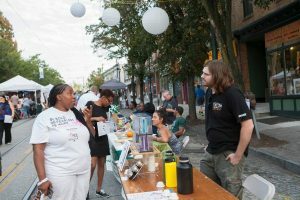 Mike the Tea Guy chats with a customer about his Craft Tea blends at Supper Sessions on the Avenue. SIGN UP AT THE FLOURISH LEVEL HERE. Still have questions? Click HERE for our FAQ, or contact Agnes Edwards at aedwards@mtairycdc.org.